Fed Ex Ground (Included in Price) - this option is offered for business addresses. Deliveries can occur Tuesday through Friday. Fed Ex Home Delivery (Included in Price) - this option is offered for residential addresses. Deliveries can occur Tuesday through Saturday. Fed Ex 2nd Day (Extra Charge) - this option is offered for business and residential addresses. Deliveries can occur Tuesday through Friday, NOT on Saturday. Fed Ex Overnight (Extra Charge) - this option is offered for business and residential addresses. Deliveries can occur Tuesday through Friday, NOT on Saturday. Always look to have your pizzas delivered by Ground or Home Delivery first, because this is the least expensive option. To estimate your delivery day using Ground or Home Delivery, first use the map below to determine how many days your pizzas will take to be delivered once they are shipped. 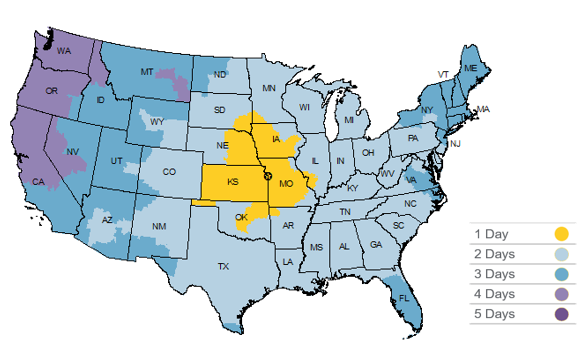 (Note: if you are located in an area that is marked on the map below as 4-Day or 5-Day, FedEx Ground or Home Delivery will not be available to you at checkout. You will be given the option to have your pizzas shipped FedEx 2nd Day or Overnight instead). Next, consult the table below to determine when you can expect your pizzas to arrive, based on the day they are ordered and the days they will take to ship. Note that orders placed before 10am CST on a given day will be considered placed that day. Orders placed after 10am CST on a given day will be considered placed the following day. If you need your pizzas sooner, you will have the option to select FedEx 2nd Day. Note that FedEx 2nd Day will NOT delivery on a Saturday. 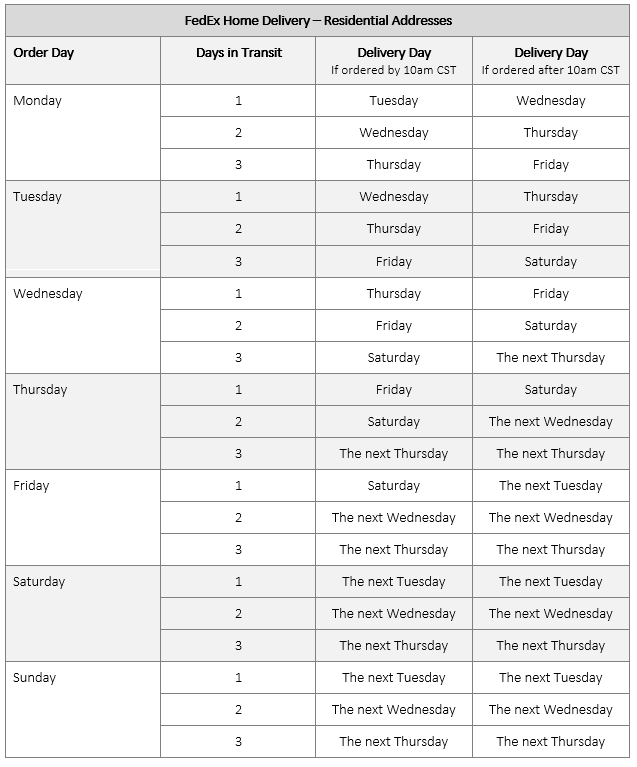 Consult the table below to determine when you can expect your pizzas to arrive, based on the day they are ordered and the days they will take to ship. Note that orders placed before 10am CST on a given day will be considered placed that day. Orders placed after 10am CST on a given day will be considered placed the following day. If you need your pizzas even sooner, you will have the option to select FedEx Overnight. Note that FedEx Overnight will NOT delivery on a Saturday. 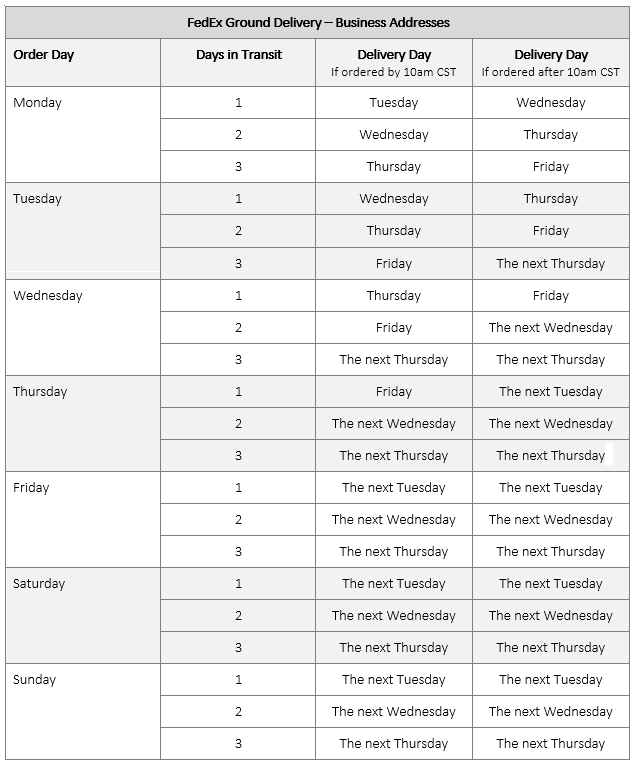 Consult the table below to determine when you can expect your pizzas to arrive, based on the day they are ordered and the days they will take to ship. Note that orders placed before 10am CST on a given day will be considered placed that day. Orders placed after 10am CST on a given day will be considered placed the following day. ** Please note that estimated delivery dates may change if shipping over a holiday.